The idea for the news page is not to duplicate the information already printed in the Magazine, or posted on our Facebook Page, but rather, to make it easy for regular users of the website to find out what is new. You can bookmark this page, then easily find stuff that wasn't here last time you visited. The link to GASCo Saftey Evening website on the Events Page has been fixed again, and the page has been updated with these new events and posters. March 17th (Sunday), VAC Words and Pictures, Arial Adventures around the world. VAC Event. Turweston 1.30pm to 3pm. Colin Hales and others. Non VAC Event celebrating the first flight of the prototype Beagle Bulldog. Download the Poster here! Air Britain Fly In Event. The Links page has had the following new links added. The Aeronca Club of Great Britain Flying Events 2019 here! D-Day 75th anniversary at Falaise Airfield information here! Download Info on Those Magnificent Men Theatre performance here! Transport Trust Red Wheel Farnborough unveiling here! The Events page and the Past Events Page have both been updated to reflect past events. The page counters on the Home Page, Membership Page, and the Taildragger Scholarship Page have been reset to zero. The VAC Awards Dinner 2019 Page was updated, and menu, wine list and booking forms added in pdf format as follows. Information Sheet* - PDF File. Booking Form* - PDF File. Wine List* - PDF File. Shuttleworth House Accomodation* - PDF File. Local Hotels and Guest Houses* - PDF File. * - The PDF files open in a new window. The Events Page was copied to the 2018 Events Page, and updated to show only 2019 events. The link to GASCo Saftey Evening website on the Events Page has been fixed, and the Listening Sqawk poster has been replaced by a link to The Airspace Safety Initiative web-site where the latest listening SQAWKs can be found. The Events page and the Past Events Page have both been updated to reflect past events, and all 2017 events on the Past Events page have been moved to the 2017 Events Page.The Links Page has had past 2018 events removed, and links to 2019 events have been updated where available. A new link is L-Birds-to-Normandy 2019. A new 2019 Events Page has been created, with new banner image. The Home Page. has been updated as to include a new banner photograph. The old banner photo is now on the 2016 Events Page. See the Photo Gallery Page for original photos and credits. Proposed New VAC Constitution - PDF File removed 07/11/2018. 2018 AGM Agenda - PDF File removed 07/11/2018. 2018 Postal Voting Form - PDF File removed 07/11/2018. 2018 Proxy Voting Form - PDF File removed 07/11/2018. The Taildragger Scholarship Page. has been updated to add the 2018 Winner, Jon Hartle. The Events Calendar. has been updated as per the latest mailchimp communication, and the Past Events page. has been amended accordingly. The About page has been amended to reflect changes in the make-up of the committee. The Farnborough Airspace Restriction July 2018 Poster has been added to the Events Calendar Page. A new Standing Order form with details of the Club's new bank account has been added to the Membership Page. The event on the Bodmin Airfield Events Poster for the 14th and 15th July has been removed as it has been cancelled. Further events have been added where the date is yet to be confirmed, or they are in 2019. The Club's GDPR statement has been added to our Home Page. The General Aviation All Party Parlimentry Group has been added to the Links Page. The Taildragger Scholarship Page. has been updated to add the 2018 Application Form. The Events Calendar. has been updated as per the latest mailchimp communication, and a new Membership form, with our new Membership Secretary's details has been added to the Membership Page.. The Standing Order form has been temporarily removed, awaiting details of the Club's new bank account. The About Page. has been amended to reflect changes in the make up of the committee. The 2018 Awards Dinner Page. has been updated to record the evening in words and photos, together with a new banner image. The Contact Page. has been amended to reflect our new Membership Secretary and Magazine Editor. The Taildragger Scholarship Page. has been updated to remove the 2017 application form and advise 2018 applications will be accepted from 1st June. A page visit counter has been added to the Taildragger Scholarship Page. and can be viewed by scrolling down to the bottom of the page. Vintage Wings and Wheels at Bodmin Airfield. The Past Events Page has been amended accordingly with 2015 and 2016 events removed to their own pages, accessible from here, (Past Events).. The Links Page. has also been updated by adding the EASA airspace infringements survey. The information is being collected and used by EASA not the UK CAA. EASA have been clear that individual’s identity will not be recorded and the data will be aggregated for statistical use. European Flight Saftey Agency Questionaire. It takes only 10 minutes to complete and will remain active until 28 February. The following events listings have been added to the Non VAC Events section of the Links Page. Bodmin Airfield Events - Download Poster here! Feet Off Ground (FOG) Events at Bodmin - Download Poster here! Bodmin Aeroclub Events - Download Poster here! GASCo Seminars (Weather Decisions) 2018. The Joystick Club (White Waltham) Events 2018.
and the White Waltham based The Joystick Club. has been added to the Clubs section. A page visit counter has been added to the Membership Page. and can be viewed by scrolling down to the bottom of the page. A page visit counter has been added to the Home Page. and can be viewed by scrolling down to the bottom of the page. The Calendar Page has been updated with all 2018 events, as well as the Past Events Page being amended accordingly. The Links Page has also been refreshed by adding 2018 events and removing 2017 events. A 2017 Events Page has been created, and a temporary 2018 events page made with a fetching new banner image supplied by Neil Wilson in preparation for updating the Calendar Page. for the 2018 season. The Chairman's Page has been updated to reflect the election of our new Chairman, Anne Hughes, and a new page has been created for the outgoing chairman Peter Wright. The Events Calendar Page has been updated, and now includes the date of Sunday December 10th for the Informal Safety Forum with Lindsay Irvine,	"We learnt about flying from that....", and booking details for the 2018 Awards Dinner being held at Shuttleworth House on Saturday March 10th 2018. The Home page also has a link to the 2018 Awards Dinner page. The Events Calendar Page has been updated, and 2018 dates have been added for the Sywell Fly-in on Sunday 18th February 2018, and the annual Awards Dinner at Shuttleworth House on Saturday 10th March 2018. A clickable GASCo Safety Evenings 2017/2018. image has been added to the top of the page, as well as a link to the Airspace Safety Initiative web-site. Their latest SQUAWK and LARS Poster can be downloaded here! The Links Page has been updated to remove past 2017 Non VAC events, and new links added as follows. The Airspace Safety Initiative web-site. The past events page has also been updated, the Events Calendar Page being amended accordingly. The Liz Inwood Taildragger Scholarship Page has been updated with the 2017 Winner, Ben Pilgrim. The Events Calendar Page has been updated, and proxy voting forms for the 2017 AGM added to download. The past events page has also been updated, the Events Calendar Page being amended accordingly. The Events Calendar Page has been updated. The Lee-on-Solent Fly in on August 12th and 13th is now not happening and has been removed. The contact details for the VAC Autum Fly in on the 23rd of September have been changed to read "Contact Turweston for PPR". The past events page has also been updated, the Events Calendar Page being amended accordingly. The Events Calendar Page has been updated. New events are July 29th/30th (Saturday/Sunday)	Vale of White Horse Fly-In, October 28th (Saturday) Visit to Great Oakley Airfield to see Percival Proctor Restorations. The past events page has also been updated, the Events Calendar Page being amended accordingly. The Photo Gallery Page has been updated to add the two new banner images, and to shift the two old banner images to the Member's Photos section. The Liz Inwood Taildragger Scholarship Page has been updated ready for new applications for 2017. Last years winner can now be found on the 2016 Inwood Taildragger Scholarship Winner's Page. The Membership Page has been updated to say how easy it is to use your bank's online system to set up standing orders, after printing out the standing order pdf form to get the sort code and account number for the Vintage Aircraft Club bank account. As you can see, this, the News page has a new banner image. It is the Vintage Aviator's Albatros DVa, taken at Hood Aerodrome in Masterton, New Zealand in March 2017 by Mark Fotherby. The old banner image of an air to air shot of the "Biggles" BE2c replica has been moved to Steve Slater's Vice Chairman's Page. Wessex Strut are holding a fly-in on Sunday 23rd April 2017 at Henstridge. 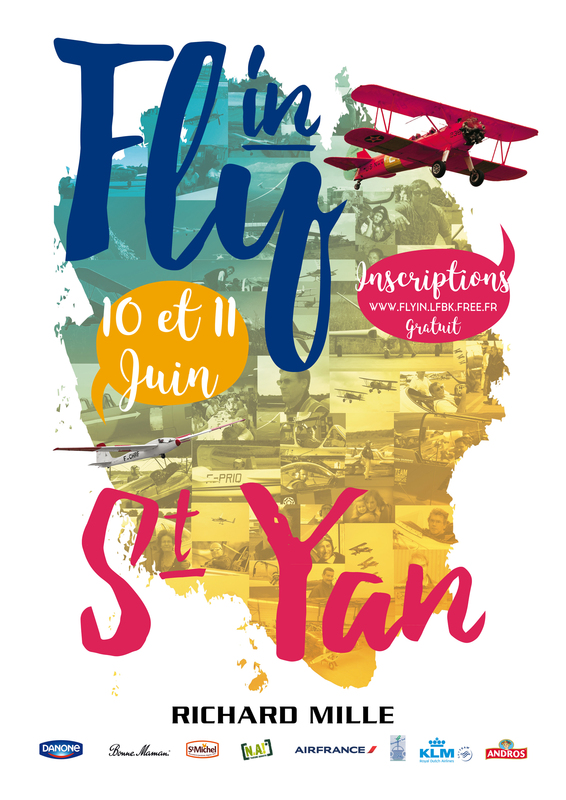 Vintage Air Rally Belgian Fly-in, Buzet, 20th, May 2017. Download Poster here! LFBK French Fly-in, 10th, 11th June 2017. LFBK French Fly-in, 10th, 11th June 2017. Download Poster here! RSA Euro Fly-in France July 7th, 8th, & 9th. Wessex LAA Strut at Henstridge. has been added to the Clubs section. The 2017 Events Page has also been updated and the past events page amended accordingly.New events added to the Calendar page are VAC Invitation to Vintage Glider Club on Monday May 29th. VAC Yorhshire Tour based Sherburn-in-Elmet Flying Club June 16th/17th/18th. LAA Rally at Sywell, Sept 1st/2nd/3rd. Note that Heveningham Hall Country Fair is now on July 8th/9th. The About the VAC Page now has a new banner photo, Rob Stobo's Jodel D9, taken by Michael Miklos. Beagle Pup 50th Anniversary, Saturday 28th April 2017. Download Poster here! Sywell Aviation Museum 2017 Events. Download Poster here! The Beagle Pup and Bulldog Club. has been added to the Clubs section. Dead links have been removed, and access to the CHIRPS feedback reports has been improved. The past events page has also been updated and the 2017 Events Page amended accordingly. The Events Page has been updated to only include 2017 events. 2016 events can now be found here.. The past events page has also been updated. A download link for the Members Survey form has been added to the Membership Page, and can also be downloaded here! The 2017 Events Page has been updated. There are nine confirmed events, and three "to be arranged" events. A download link for the Trophy and Awards nomination form has been added to the About VAC Page, and can also be downloaded here! The Links Page has been updated. A link to White Waltham Airfield has been added. The past events page has also been updated and the 2016 Events Page amended accordingly. The 2016 Events Page has been updated. There is now a venue for the AGM, The Wellington Room at Wellesbourne. Also note the date change from Saturday 26th Novenber to Friday 25th November for the Film Evening at Bicester. The Taildragger Scholarship page has been updated to show the 2016 winner, Michael Atherton. The Links Page has been updated. Links to the Historic Aircraft Association Symposium 29 Oct 2016 Download Poster here! Lunday Fly in, Sunday 30th July 2017. Download Poster here! RAeS General Aviation Conference, Londo, 14th Nov 2016. Download Poster here! have been added. Expired event links have been deleted, although, if there was a link to a pdf poster for the event, those can still be downloaded from this page by scrolling down to the date when the event was first added to the website. More photographs from Mike Miklos have been added to the Photo Gallery page The past events page has also been updated. Helipaddy Summer Fly In Sunday 14th August 2016, White Waltham. Expired event links have been deleted, although, if there was a link to a pdf poster for the event, those can still be downloaded from this page by scrolling down to the date when the event was first added to the website. Miles Aircraft Fly In 23rd July 2016, White Waltham. Download Info Here! Summer 2016 We can offer a nostalgic experience in a World War 2 TIGER MOTH at Bodmin Airfield. Download Poster!. The 2016 Events Page has been updated to reflect the cancellation of this years VAC Northern Tour. The venue for the Auster, Beagle, and Miles Aircraft Fly In day has also been changed from Shoreham to Redhill. A VAC "Down Memory Lane" Film Night event on Saturday 26th Nov. at Bicester has also been added. The past events page has also been updated. The Liz Inwood Taildragger Scholarship page has been created and is now live, with down-loadable pdf application form. The Links Page has been updated. New links to GASCo Weather Seminar Devon 21st September 2016 - Download Poster here! and Shobdon Airfield Vintage Fly-in Event May 29th & 30th - Download Poster here! have been added, and the Aeronca Club of Great Britain 2016 Events - Download Poster here! has been changed to reflect the decision to postpone the trip to France untill 2017, to allow the club to support the LAA 70th Aniversary tour starting Aug 27th and ending at the LAA Rally on Sept 2nd 2016. The 2016 Events Page has been updated. There is a new link to a poster for the Redhill Auster / Beagle / Miles Fly-in. The past events page has also been updated. The Links Page has been updated. New links to GASCo 'Ditching & Sea Survival' Seminar - 23rd March 2016 - Download Poster here! and ‘GA Sea Survival Conference’ on 2nd April 2016 at the St George Hotel, Tees Valley Airport - Download Poster here! and The Transport Trust have been added. The Events Calendar has been updated with a link to Important RAF Operations in South West for April 2016. Check Notams!. The contact person for the Bicester Heritage Scramble on the 24th April has been corrected. Peter Wright is the man to go to. The past events page has also been updated. The Links Page has been updated. A new link to GASCo Weather Seminar 16th April 2016 - Download Poster here! has been added. The Events Calendar has been updated to include the latest events information as advised on the March edition of the emailed VAC Newsletter. Please note the date change for the VAC Northern Tour (previously the Yorkshire Tour). Now taking place on Friday 24th June to Sunday 26th June 2016. The Bicester Heritage Scramble on Sunday 24th April, and the VAC Mayfly Meet Fly In at Turweston on Saturday 21st May have also been added. The past events page has also been updated. The Links Page has been checked and amended for broken and misleading links. New links to Imperial War Museum Duxford Events 2016 and UK Confidential Human factors Incident Reporting Programme (CHIRPS) have been added. CHIRPS reports can be downloaded from here. Autumn and Winter 2011 editions of Vintage and Classic have been added to the magazine page, and new photographs have been added to The Photo Gallery page. The Events Calendar has been updated to include the latest events information as advised on the January/February edition of the emailed VAC Newsletter. The calander now includes the Bodmin Ladies Day Fly-In, 30th April, and the Wellesbourne Wings and Wheels, 19th June with the event posters still available on the Links Page. The past events page now includes a link to the Tree of Hope Charity thank you poster for the collection at the Audley End hanger tour. The Events Calendar has been updated to include the latest events information as advised on the first January edition of the emailed VAC Newsletter. If you are a paid up member of the club, and you have not been receiving the newsletter, please email me at vac.webmaster@thirdrocksystems.co.uk. A Soft Airfield Operations Poster has also been added to the page. The Links Page has had several Non VAC events added, as well as new links under Clubs and Publications. The Events Calendar has been amended to add two new dates, 31st October for a Turweston Engineering Day, and 14th November for a visit to the Trenchard Museum. The past events page has been bought up to date. A link to the new 2016 events page has also been added. Autumn 2014 and Winter 2014 pdf copies of Vintage and Classic Magazine have been added to the magazine page as well as the Spring and Summer 2012 copies. The club's event only mobile phone number has been removed from the contacts page, as I have been reliably informed that it no longer works. The Events Calendar has been amended to show the new dates for the Sackville Farm Fly In, now 12/13th September and the new date for the AGM Fly In, now 17th October at Wellsbourne. A number of Non VAC events have been added to the Links page. The list of Non VAC events has been taken from the latest issue of "Vintage and Classic", but details have been updated as per the event organiser's own websites. Please check with the organisers before departing. Congratulations to Steve Slater for being appointed as the new Light Aircraft CEO have been added to the Chairman's Page. A new event has been added to the Events Calendar page, (VAC Fly In, Turweston, Saturday October 24th) and three photos have been added to the member's photographs section of The Photo Gallery page . The Past Events page has also been updated. Issues 39 and 40 (Autumn and Winter 2012) of Vintage and Classic Magazine have been added to the bottom of the magazine page and Issue 46, (Summer 2014) has been added to the top. Crete to Capetown Trans African Vintage Air Rally 2016 and Redhill Aviation Festival 14th June 2015 "Hogroast & Harleys". The past events page has been bought up to date. All pages now include the full sidebar menu, giving access to all the site's main pages from any other main page. The page about the club's Fly In Events has now been updated. Information about the club's Ground Events has now been updated. The Chairman's Page has now been updated. The VAC Sales Page has now been updated. Download Poster for March 22nd Spring Fly In. Link also on the Events Calendar Page. The past events page is now operational. At the moment, events are just listed here from the Events Calendar page as they pass, with a link to the facebook page for photos etc. In future, the link will also be to a separate page with photos and an event report, especially for major events. The magazine page has now had a makeover. A new membership page has been created. The membership page now includes new 2015 versions of the membership and standing order forms, reflecting the fact that Paul Loveday is now the membership secretary. New Contact Details can be found here. A new image has also been used on the Events Calendar page. If you have interesting photographs, stories, or video you think would be suitable for the club website, please get in touch with the VAC webmaster. A new About the VAC page has been created. A new Home or Index page has been created. Welcome to our new look news page. If you are reading this, then you will already have some idea of what our whole website will look like as it is gradually updated over the comming weeks. The Events Calendar page has now been updated in the new format, with all our 2015 events, and the Links page has also been updated in the new format.